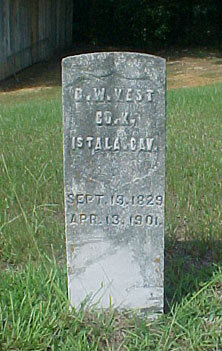 George W. Vest and William A. Vest were sons of James Vest, born 1791 in GA, married Sallie Harvey in 1809, and died in 1868 in Winston Co., AL. George and William enlisted in the 1st AL Cav. USA, while their brother, James J. Vest, enlisted in an Arkansas Confederate regiment. Their half brothers, Henry K and Jonathan Vest, also served in the unit. George was born September 19, 1828 in Morgan Co., AL and died April 3, 1901 in Cullman, AL. Other children of James and Sallie Vest were: Albert, Lucy, Martha Nancy and John Vest.